Small Forest Timber Owner Blog for WA: Sayonara, Slash! This pile had flames around 20' high, which is not uncommon. 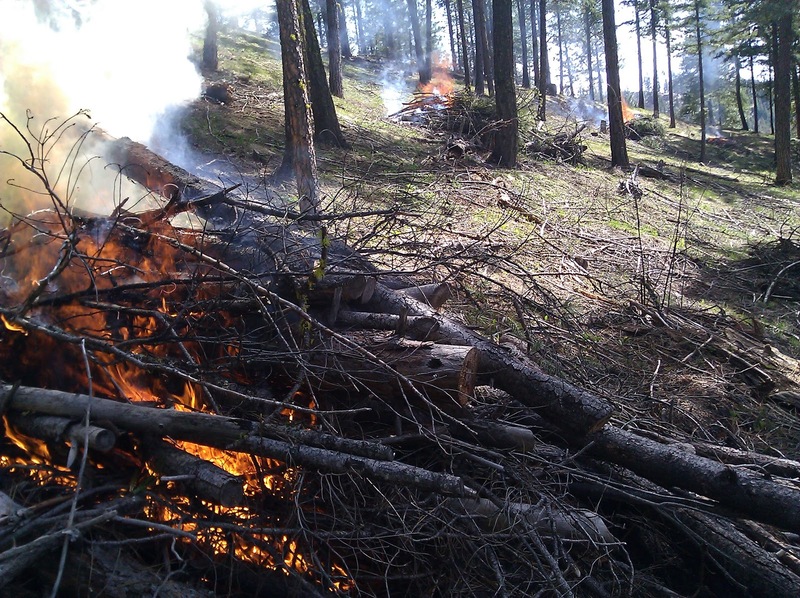 We burned 91 piles like this in March-April. ﻿﻿Pruning trees reduces fire risk. The limbs become slash on the ground. Slash becomes piles. Piles become fire. Firewise practices include reducing "ladder fuels" by pruning trees up above the level of a ground fire Through the NRCS EQIP program we're pruning trees up to 16 feet. Some debris can stay on the ground to rot and return nutrients to the soil. Too much debris is a fire risk. To reduce that risk, some of the wood can be piled to be burned when the ground is wet or snow-covered. We do a combination of practices, piling small-diameter limbs and tops, leaving wood larger than 4" diameter as ground wood. The amount of pruning waste is impressive. The lower limbs of one mature tree produces enough slash to make a pile 4' x 6' and 3' or 4' high. Most piles are 4x6x8' and include the bucked stems of small trees removed during understory thinning. We come back around in early March, when there's still snow on the ground, and torch the piles. A propane flame thrower works efficiently. 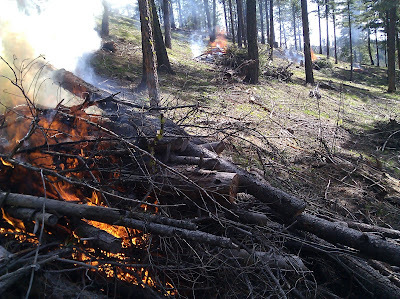 We burned 91 piles in the spring of 2011, and it's a lot of work. Usually we had 2-3 people working their own areas. We worked 4 weekends this spring, actively tending fires for most of the day. Working my way across a slope I lit the pile in the far distance, then the nearer piles, and I'm waiting for this pile to grow to its maximum size before I move on to the piles upwind of me on this slope. We torch one pile at a time per person, and tend that pile until its flames subside. That can take 10 minutes, or 45 minutes, depending on the pile. Then we move on to another pile. Throughout the day we circle back to all piles and "throw in the bones" that have escaped the flames. We use a "fire rake" for this, but a stiff yard rake or hoe is sufficient. As the ground dries we start carrying a water pack with a sprayer. That's it 'til fall. It's now too dry to do this -- the fire crawls across the slope through the duff, creating more work for us just to contain the spreading fire.